Practical and versatile, this model is adjusted manually to the size of the carton in less than a minute and ideal for light and small cartons as well as bigger and heavier ones. 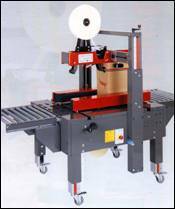 High quality 75mm-3" belts and spring loaded belt arms ensure uninterrupted process. Easy to adjust upper bridge and lockable self centering side conveyors. Heavy duty frame for industrial applications. Greater accessibility due to motors and gears installed under the machine. Adjustable legs with measuring scales for fast set up. Upper bridge can easily be repositioned for taller cartons. Locking swivel casters for greater mobility. Easily removable drop in bottom taping head for quick tape changes.